The Mantra given in this post is simple to chant and is suitable for any one who aims to become a reputed public speaker or debater. 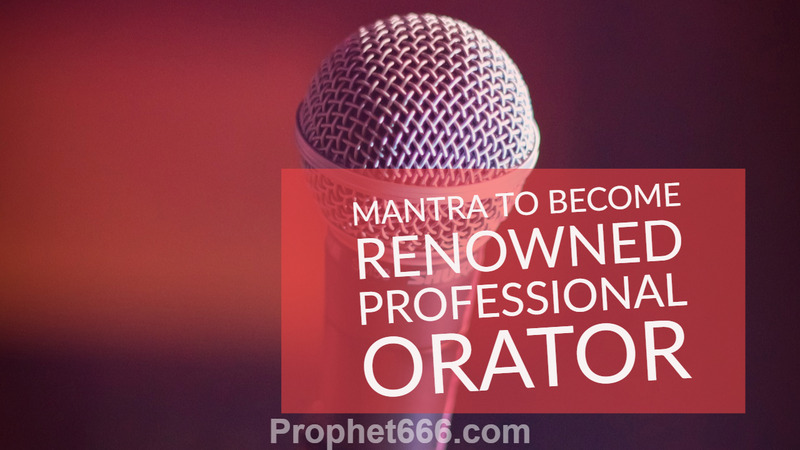 The Mantra should also be useful for poets, actors, politicians and sales persons whose careers or professions primarily revolve around their ability to convince people with their vocal skills. There is no need to engage in any kind of Puja-Vidhi of Saraswati Mata in order to chant this Mantra. The practitioner can chant it for a fixed period of time or a fixed number of chants at the same time daily, in order to benefit from the Mantra. It is also recommended that the practitioner cultivates clean and healthy habits, while practicing this or any other related Mantras of Saraswati Mata for the same purpose. This includes both physical as inner cleanliness or Satvikta, which is a clean and pure lifestyle. Mantras dedicated to some Hindu deities, including Saraswati, Lakshmi and Shri Ganesha will be more helpful and effective for people who lead a Satvik or Rajas Guni way of life. Along with what is mentioned above, it is also essential to have patience while practicing such Mantra Savannas, which start becoming effective after the practitioner tunes in correctly to the vibrations of the Mantra and becomes one with the Mantra. Sound is energy, like everything else in the Universe and it is essential to flow with that energy. : I worship Lord Hayagreeva, who is the very form of knowledge, pure as a crystal, and who is the support of all knowledge. हयग्रीव सम्पदा स्तोत्रम के अनुसार हयग्रीव हयग्रीव हयग्रीव के उच्चारण से मनुष्य पापों से मुक्त होता है और वाणी गंगा के समान प्रवाहमान होती है . अथर्वण वेद के मन्त्र खंड में हयग्रीव कवच है ,जिसके पाठ से व्यक्ति साक्षात वागीश्वर हो जाता है .हयग्रीव संहिता में वर्णित हयग्रीव कवच के पाठ से मूर्ख भी वृहस्पति के समान बन जाता है .हयग्रीव पंजर में अज्ञान के अन्धकार को छिन्न भिन्न कर ज्ञान देने के साथ ही रोगनाश,दारिद्र्यनाश ,शत्रुनाश की प्रार्थना की गई है . सहस्र नाम स्तोत्र वागधीश बनाने के साथ पापी को पाप से ,रोगी को रोग से मुक्त करता है .यह स्तोत्र बंधन से ,भय से ,दरिद्रता से ,आसन्न आपदा से मुक्ति दिलाता है .